Let’s discuss my favorite fashion topic: shoes. They’re the piece I always start with when it comes to a new season, and with the summer swiftly wrapping up, fall shoes are currently top of mind. Before I begin to think about coats or sweaters or all of the layers I may need to pile on as the temperatures begin to drop, it’s shoes that are poised at the top of my personal shopping list. There’s one easy reason: They’re the easiest piece to begin wearing in a transitional wardrobe between seasons. While boots are often added to outfits during the later fall months, heels are a great place to start because you can wear them now with all of your jeans and summer dresses. Are you curious to know what the biggest heel trends will be for fall? Below, I’m highlighting five heel styles that will be on the feet of every cool fashion girl in the month ahead. Yes, you’ll be spotting these on your Instagram feed and all over the street style scene at fashion month. Get a head start on your shopping now and add the coolest fall heel trends of 2018 to your cart. Strappy sandals were one of the biggest shoe trends for summer. For fall, they're finished with a minimalist, modern silhouette. The Row's sandals will no doubt be one of the most popular shoes of fashion month. Jewel tones are a yes. 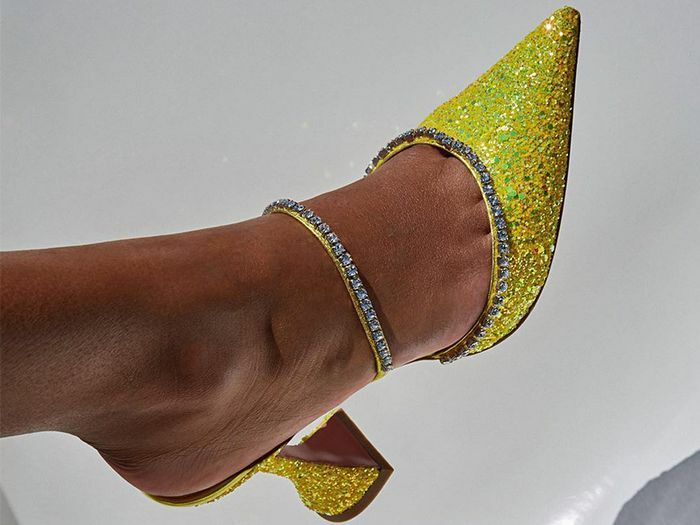 Get ready for a heavy dose of sparkle because heels for fall are dripping in crystals. Just launched and on every fashion girl's must-buy list. An added perk about these beauties? They super comfortable. Now these are party shoes. Pumps aren't always the most exciting heels in the closet, but for fall, they got a shiny new makeover. This time around, they've been updated with modern silhouettes and new textures like woven leather. I can't decide what I like more: the glove silhouette or the woven leather finish. Don't stop wearing white this fall. Modern and cool in every way. From leopard to tiger to zebra to crocodile to snakeskin, all of the wild animal prints are trending hard in the heel department. To wear with midi skirts this fall. You really can't beat this price. Kitten heels for the win. Next: Shop the 19 best things I wore this month.